Well maintained home is tastefully decorated with nice furnishings. Beautiful sunroom overlooking a picturesque lagoon. Large LCD TV in sunroom. Has large family room with LCD TV and fireplace. Modern kitchen and large dining area with table and chairs to seat 8. Beautiful deck opens from sunroom. King bedroom, queen bedroom, and twin bedroom with flat screen LCD TV. Easy access to beach. Great for walking or biking. Five bikes are furnished. Neighborhood swimming pool serving 20 homes is 75 - 100 yards from driveway. Walk to beach. This is the perfect vacation spot! This house has everything anyone could want. It’s set in a very peaceful area with a beautiful lagoon in the backyard. We spent many hours in the sunroom just watching the wildlife. The house also had bikes so we didn’t have to rent any. The kids loved riding them to the beach. The owner was very quick to respond to any questions that I had and was extremely helpful! This is by far one of the best, most relaxing vacations we have ever taken. We will definitely be back! Just returned yesterday from our week in HHI (Shipyard). We've been coming to the island for close to 30 years and this home checks off all of the boxes. It was beautiful when we chose to stay here a few months ago based on the pictures and reviews, but we were pleasantly surprised to find new furniture in the living area, new bedspreads in the King and Queen bedrooms, and gorgeous laminate hardwood throughout the main room and kitchen. The sun room on the back of the house overlooking the manicured and landscaped backyard and lagoon is just a wonderful space to hang out. We had heat indexes up to 110 degrees and the room remained plenty cool with the AC unit and two fans going. Even the "extra" room downstairs stayed cool enough to use with the fan running. Another huge benefit is the fact that you communicate directly with the owner (Barbara) and not a run-of-the-mill rental company. Barbara left us a note on the kitchen counter for when we arrived and was super responsive to any questions we had. It was clear that they consider this home much more than just a rental unit... it has their wonderful touches all over the house and yard. Everything works. The gas grill sparked right up... which we used to grill burgers, steaks, and shrimp. Every utensil you could possibly need is in the kitchen, along with extra light bulbs, basic tools, baggies, aluminum foil, etc. We prefer Shipyard and have owned a house in Carolina Club, but this location in Shipyard is perfect. Quiet, close to the pool and beach, and several of the houses in the cluster seemed to be occupied by the owners year round, which helps keep an eye on everything. So, if you are down to a few homes and this is one of them, just take the plunge and click the "book now" button. You won't regret it! Our family had a wonderful week in this home in November! The heated sunroom, which affords such beautiful views of the lagoon was our favorite place to unwind. The well-manicured lawn, beautiful palm trees, the variety of birds seen and the fish jumping in the lagoon offered great delight. We were immediately impressed with the decor and cleanliness of the house, especially the windows. There’s nothing worse than having a beautiful view abscured by dirty windows. My husband said he had the best night’s sleep since retiring sleeping on the mattress in the master bedroom. The gas grill with an extra gas bottle ready to go had the one we used run out was a big plus. The bicycles were ready to go and we loved riding on the wonderful bike paths in Shipyard. By bike the trip to the ocean was five minutes with plenty of bike racks to park them in so you could walk on the beach! Kingston Cove was very quiet. We cooked all but one meal in the well stocked kitchen. For those who want a television in every room this place has that too. Barbara was such a wonderful person to work with and we would definitely love to stay here again. Amazing home in Kingston Cove!! We've been vacationing in Hilton Head for years, Shipyard in particular, and absolutely love it! This year our boys' schedules made choosing a time to vacation challenging. Barbara has always been so kind and thoughtful, and this year was no different. She was extremely accommodating, allowing us to stay in her beautiful home for 10 days! We have rented the Lucas' home before and wouldn't want to rent any other. It's so well maintained, clean and comfortable. A true home away from home. 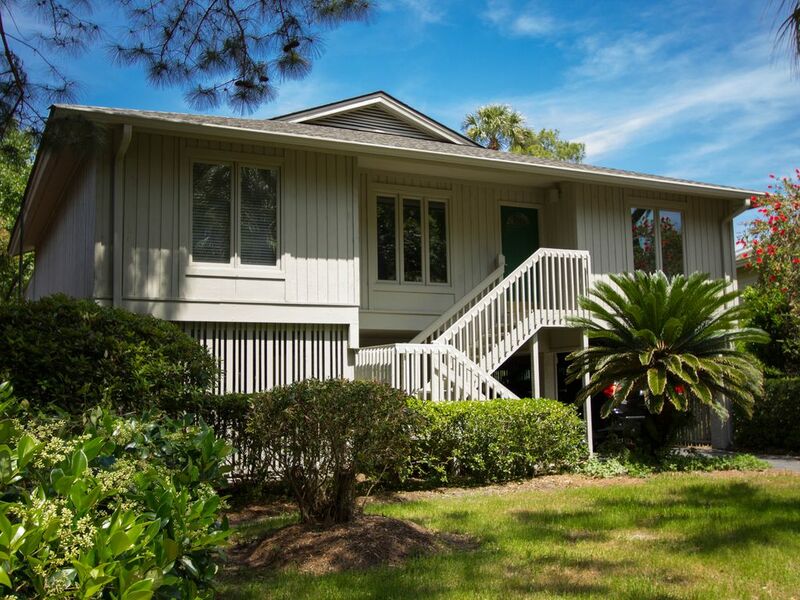 The location is perfect for the beach, pool and lots of bike riding. We will definitely be back again! We LOVE this home away from home!!!! My family and I have been vacationing in Hilton Head Island for many years. We have always stayed in Shipyard. This year was the first time that my family rented a private home. I was pleased beyond what I expected. This home is gorgeous!!! The beds were comfortable. The kitchen was stocked with pots, pans, dishes, oils and spices. The sun room was beautiful!! We loved grilling out back near the pond. The wild life was interested to watch during our peaceful mornings with coffee. The kids enjoyed the downstairs “get away room.” It was very nice to have the owner, Barbara, be so kind and thoughtful. She called after my vacation just to make sure I had a good vacation. I will definitely be visiting the Lucas’ home again! Thank you for allowing us to stay in your beautiful home away from home! We've been coming down to Hilton Head for about the past 25 years, with a majority of those years spent in Shipyard. This was our first that we stayed in Kingston Cove and I will say it will not be our last. The Lucas' home is everything you dream a vacation home to be; Barb was such a pleasure to deal with and was very responsive. The setup was perfect for us. We loved that 2 of the bedrooms and bathroom could be separated from the unit via the pocket door, which was great when if our family was over after our 4 and 2 year old went to bed. Another feature we loved was the four seasons room that had the option of AC for the hotter part of the day. A few other pros were: cozy home with great southern charm, short bike ride to the beach, private house on a cul-de-sac, great community pool, car port that kept the car cooler since it was in the shade, plenty of bikes and the list goes on. We cannot wait to plan our next visit! Home is on quiet cul-de-sac in Shipyard Plantation, near shopping, movies and restaurants. It backs up to lagoon for fishing and to golf course.